Correct setup is critical to the most important Internet application: E-mail. 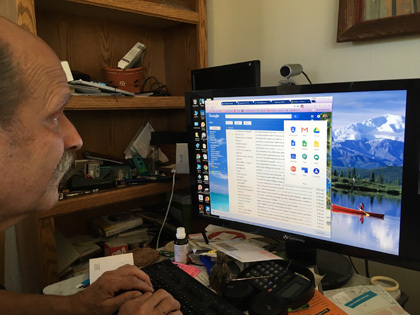 Frank at ByteWise / PC 911 has extensive experience not only in setting up E-mail clients such as Outlook or Thunderbird, but also in helping people use various webmail interfaces such as GMail, Yahoo, Outlook.com (formerly msn and hotmail) and RoundCube. Whether you prefer to use IMAP or POP or HTTP protocols to pick up your E-mail from E-mail servers, and whatever E-mail clients you choose, Frank can help you. There are various ways to manage and read E-mail. The most popular access method uses the IMAP protocol for mobile devices and computers that maintains your E-mail on a server and enables you to see the same view of your inbox from all of the devices and computers that you use. On desktop and laptop computers that means using webmail or an E-mail client. E-mail clients give you greater ability to manage and archive E-mail but are often more difficult to setup correctly. Windows 10 users can use Outlook.com. Outlook on Windows 7 computers and MacMail on Macintosh computers are the default E-mail clients, and Mozilla Thunderbird is a powerful alternative that runs on both kinds of computers.